Epigenetics is the structural adaptation of chromosomal regions to register, signal, or perpetuate altered activity states. Alterations to chromatin via direct DNA modification (e.g., methylation) or post-translational modification (PTM) of histones (e.g., acetylation, methylation, and ubiquitination) affect gene transcription. To date, acetylation/deacetylation of histone lysine residues and methylation of DNA have proven to be of greatest clinical significance amongst epigenetic modifications. Recent approval of anti-cancer drugs such as Vorinostat and Decitabine, which target histone deacetylases (HDACs) and DNA methyltransferases (DNMTs), respectively, is evidence that reprogramming gene expression on an epigenetic level holds great clinical promise. Drugs targeting critical PTM-regulating enzymes continue to populate pharma development pipelines. For over a decade, Enzo Life Sciences’ Epigenetics platform has revolutionized the use of HDAC & Sirtuin enzyme activity kit assays, freeing researchers from cumbersome protocols required with radio-labeled or other modified histone-based methods. Our high-quality assays utilize patented substrate/developer chemistry in combination with high-activity, high-purity enzymes, to deliver higher quality hits. Broad class HDAC/Sirtuin screening assays are available in fluorescent, colorimetric, and chemiluminescent formats. FLUOR DE LYS® HDAC & Sirtuin Assays are convenient broad class screening formats. HDAC activity varies due to different expression levels based on cell types. Therefore, cell-based HDAC experiments are especially relevant for their ability to address the natural context of HDAC enzymes. We offer many targeted enzyme-specific HDAC/Sirtuin assay kits. Check out our FLUOR DE LYS Substrates and Accessories for more information on our substrates, standards, developers, and nuclear extract. COLOR DE LYS® HDAC colorimetirc activity assay kit (Colorimetric Histone de Acetylase Lysyl Substrate/Developer) is a highly sensitive and convenient alternative to radiolabeled, acetylated histones or peptide/HPLC methods for the assay of histone deacetylases. 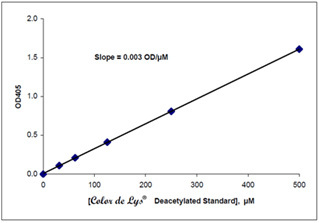 Our COLOR DE LYS® assay is designed to measure HDAC activity in cell or nuclear extracts, immunoprecipitates, or purified enzymes. The included HeLa nuclear extract can be used as a positive control, or as a source of HDAC1 and 2 for use in inhibitor screening. Reaction scheme of the HDAC Colorimetric Activity Assay (patent pending). Deacetylation of the substrate sensitizes it to the developer, which causes an increase in yellow intensity and absorption at 405 nm. 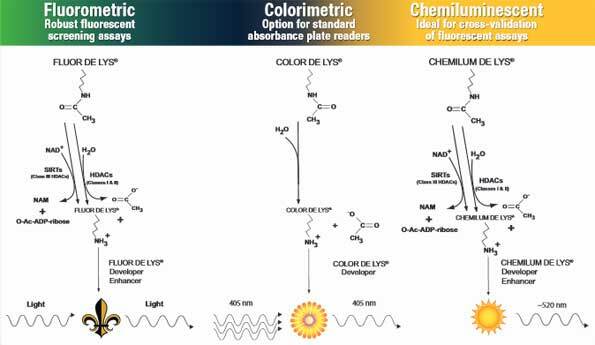 CHEMILUM DE LYS® HDAC/SIRT Chemiluminescent Drug Discovery Kit is the best option for false negatives or positives resulting from the effects of compound(s) being screened on elements of the report as summarized below. Based on our CHEMILUM DE LYS® substrate and developer combination, the HDAC/SIRT Chemiluminescent Drug Discovery kit provides a chemiluminescent alternative to radiolabeled and HPLC methods for HDAC activity. Compared to traditional luciferase and fluorescence-based screening assays for HDAC and Sirtuin activity, this platform offers a 3-step assay procedure designed for cellular extracts, immunoprecipitates, or purified extracts. Enzo Life Sciences provides a comprehensive portfolio of widely cited active HDAC and Sirtuin proteins, HATS, methyltransferases and demethylases. Our SCREEN-WELL® Epigenetics library contains 43 compounds with defined activity against epigenetics-regulating enzymes, each of which can be supplied individually upon request. Our portfolio of reagents also includes antibodies for the detection of key epigenetics-regulating enzymes and substrates, including modification-specific antibodies for acetylated, methylated, phosphorylated or ubiquitinated epitopes. Further details can be found on our Epigenetics platform page. Please contact our Technical Support Team for further assistance and check out our TechNotes, an easy way for you to see how Enzo Life Sciences is living up to our motto: Scientists Enabling Scientists™.